Calendula is Marigold, and is a popular holistic approach in treating a variety of skin problems ranging from skin ulcerations to eczema. Calendula is available as a cream and salve and has no known side effects. California Baby is a popular brand of gentle products for children with sensitive skin. 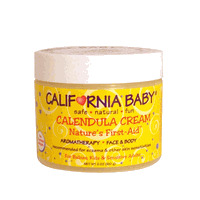 We recommend trying California Baby Calendula Cream for baby and child eczema. With a light herbal scent, California Baby’s Calendula Creamworks to soothe and heal skin naturally—so effective that the company calls it, Nature’s First-Aid™. Below are some of their other products that also work well in treating eczema. California Baby Super Sensitive Shampoo & Bodywash – All natural, paraben free California Baby Super Sensitive Shampoo & Bodywash is recommended for washing babies delicate skin, or anyone with sensitive skin. No need to have two different products especially for busy parents washing wiggly babies in the bathtub. The no tears formula means happy babies and happy parents. California Baby Everyday Lotion – No Fragrance – California Baby Super Sensitive Everyday Lotion has no added fragrance, and the company claims it is safe, natural, and fun. The label states California Baby Super Sensitive Everyday Lotion is free of common allergens, that it are not tested on animals, contains no animal ingredients, is eco-friendly, and biodegradable, and is made in the U.S.A.
California Baby SPF 30 Sunscreen Lotion – Environmental Working Group rates this as an excellent sunscreen for babies, children, and adults! It is also WebMD Expert’s Choice Winner! Unfragranced, PABA free, non-chemical, California Baby® sunscreen is perfect for those with skin sensitivities or fragrance allergies. California Baby®’s active ingredient is a highly micronized titanium dioxide that scatters and reflects dangerous UV rays, offering UVA-UVB broad-spectrum protection. This lotion is simple and elegant; it glides on smoothly and will not slip off when it comes into contact with water, so you may rest assured that it will last. Non-staining formula, very water-resistant, and highly recommended by leading dermatologists and allergists for their patients with chemical sensitivities and fragrance intolerance. Have you used California Baby products? What is your review? I've used the sunscreen and it is awesome! I have rosacea and eczema so my skin is very sensitive. This product heals my dermatitis breakouts and calms the rosacea. The calendula is the secret. I have been looking for a product with this in it for a long time. In less than a week, my skin has improved 70%. Love this stuff. This is the best product I have found for my 5 month old sons severe eczema. We tried everything-cortisone creams, Aquaphor and Eucerin – nothing worked. Within days of trying this product my son's eczema cleared up. I use it every day-twice a day-as a moisturizer in the morning and after his bath at night. It smells great and is lightweight. The only downfall about this product is that it is very pricey. But my nanny dislikes the fragrance. It works and is worth the cost. Honestly I don't like them.I've used the sunscreen and I felt the smell was over-powering and did not blend in well.I've also used the diaper cream and feel it's too liquidy and also has and unpleasant oder.Plus the price is very high for all their products. What if I'm allergic to calendula? This means I can't use this cream, right? Um Eve don't use anything you are allergic to.